Just as Amir Khusro was born at a decisive juncture of history, so did his music lead to a decisive phase in the development of North Indian music. Historically, the evolution of this art form has been characterised by deviance from traditionally acknowledged principles. For example, the great scholar Sarangadeva, writing just prior to Amir Khusro’s birth, commented that the music of Bharata and Matanga had become extinct. Amir Khusro realised that this convention was outmoded. Accordingly, he adopted as the fundamental note of the object the first shruti, called teevraa. This yielded a scale comprising seven natural notes, which is familiar to us as the natural scale or the Bilawal thaat. According to many, musicians in the South continued to follow Sarangadeva’s system, which led the northern and southern streams of music to gradually diverge and coalesce into self-contained musical systems in their own right. Therefore, it seems Amir Khusro’s innovations have played a critical role in shaping Hindustani music into what it is today. Khusro is also regarded by many scholars as the creator of Raga Sarparda, or Sarparda Bilawal as it is now known. A characteristic feature of this Raga is that it uses only the seven notes of the natural scale. This lends credence to the belief that the practice of using the natural scale began with him. Apart from Sarparda mentioned already, Khusro is popularly credited with having devised Ragas like Yaman, Zeelaf, Sazgiri, and so on. He himself mentions in his magnum opus Ejaz-e-Khusravi several names like Hijaj, Jangula, Sarparda, Ghaaraa, Mujeer, Eman (Yaman), Farodast Waakhrez, Farghanaa and Husaini. (Das 2004: 213) Interestingly, he himself does not claim credit for their creation, and instead modestly states that they already existed in Indo-Iranian music. Of these, only Yaman remains popular in today’s day and age. Sarparda is performed only by members of selected Gharanas. Hijaj and Zeelaf are performed only very rarely. Saazgiri is even more obscure. Others like Farghanaa and Farodast Waakhrez have disappeared altogether. The origins of this musical form are shrouded in obscurity. Some scholars maintain that many forms of Qawwali existed much before Khusro’s time. At the same time, there is little doubt that he played a seminal role in propagating and popularising Qawwali. Many compositions of Amir Khusro remain as popular today as they were in his own time. However, Khusro’s contribution to Qawwali is so extensive that it deserves a separate study in its own right. Here, we shall confine ourselves to the impact of this form of music on classical music. 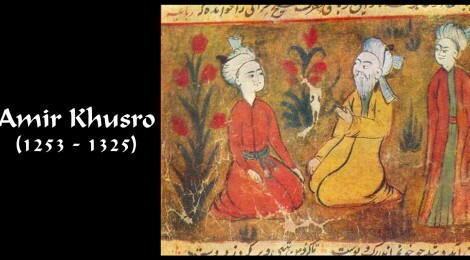 Amir Khusro is said to have created six forms of music, namely Qaul, Qalbana, Khayal, Tarana, Naqsh, and Gul. The last two have lapsed into obscurity. On the other hand, the Qaul remains ever popular. Many consider it obligatory to begin a Qawwali recital with a Qaul. There are some who believe that Amir Khusro did not exactly create this form, and that it had been incorporated into Sufi traditions much before Khusro’s birth. In essence, the Qaul comprises of a Hadith (saying) of Prophet Mohammed, to which are appended certain apparently meaningless syllables such as nom, tom, yalali, yalala, ta na na and so on, which are today identified with the Tarana form. These syllables actually carry considerable mystical significance, and are used by Sufis as incantations to be repeated over and over. In the cotton-carding-inspired poem, we saw the same semantically significant words repeated over and over in such a way that all syntactic meaning is lost. The vocalist Ustad Amir Khan has contended in many places, including his seminal 1966 article, that Tarana syllables originally did hold semantic significance, in that they are actually corrupted forms of Persian and Arabic words. Over time and rapturous repetition, however, they were corrupted in a way that obscured their meaning. The meaning of the first two lines, a saying of Prophet Mohammed, is as follows: ‘Whoever accepts me as a master, Ali is his master too.’ It is followed by the mystical syllables discussed above. The Qalbana is now performed much less frequently. In fact, it has faded out of public memory to such an extent that its very characteristics and contours are a source of controversy. Structurally it is not unlike what is called a Rubaidar Tarana. Its first stanza, the Sthayi, consists of mystical syllables, the next (or Antara) incorporates a Persian couplet. An important distinction is that it makes use of several different Talas. The present example, for instance, begins in Firodast, changes to Ektala, Jhaptala, Teentala, and then returns to Firodast. Abhik Majumdar teaches in a Law School in Odisha. He has published a biography of Bhimsen Joshi titled "Bhimsen Joshi: A Passion for Music". Abhik's interests lie in classical music, traveling and world cuisine.